As readers of this blog will know, I backed Heidfeld to win this year's championship. I say that because I do not want to be accused of being a Hamilton groupie, the inevitable chorus from the Hamilton bashers whenever anyone has anything good to say about the man. It was this constant refrain so evident in all the sites and blogs on the net that, a few days ago, decided me that it was time to re-visit the subject of Lewis Hamilton. Last year we all became fed up with the unremitting praise heaped on the wonder boy by the British media; this season it has been the turn of the bashers. It matters not what Hamilton does or says, the bashers will find a way to mock and scorn and I, for one, am as tired of their prejudice as I was of the groupies. As an instance, Lewis' reply to Ferrari's lawyer in the recent appeal case has been seized upon as evidence of Hamilton's arrogance and pride. Yet none of us know what caused those remarks; we have no transcript so we have no idea whether the lawyer had just delivered an ignorant and uninformed estimate of a racing driver's task, so inviting the kind of response he received. To me, it sounds as though that is exactly what happened and, until we know otherwise, to classify Hamilton's words as arrogant is prejudgement based upon bias against him. That is the kind of claptrap so often encountered in comments on blogs and media sites on the net. The anti-Hamilton camp has become so entrenched in their hatred of him that he cannot do anything right. If he attempts to overtake, he is being rash and stupid, not thinking of the championship. If he does not attempt to overtake, he is not a real racer and is accused of only being able to win from the front. The truth is that Lewis is a young man who occasionally departs from the corporate speak he has been trained in and sticks his foot in his mouth. And thank goodness he does - the sport hardly needs another boring mouthpiece of the PR machine. Like all the drivers, he thinks he is the best and would not be in the game were it not so. Racing drivers have to believe in their abilities in a way that accountants do not; in F1 we have collected the young men with the biggest egos on the planet. They have to be. Those who remember Ayrton Senna's early years in F1 will know that he too was constantly accused of arrogance in his public statements. The other drivers were only too ready to seize upon an opportunity to criticize him; he was just too obviously something special and their egos demanded that they find excuses for being beaten. That was the root cause of the deep animosity between Ayrton and Alain Prost - Senna always knew he was the best but his confidence threatened Prost's belief in his own superiority. And now I will be accused of saying that Hamilton is the new Senna. Well, he might be but I am not prepared to think so just yet. I use the example to show how any driver who has an impressive debut in F1 will meet with the kind of sour grapes that Hamilton is currently being served. As F1 enthusiasts, we need to rise above such gut reactions and be more realistic in our estimations of drivers. I think it was Senna who also said that every driver is allowed one mistake a year. Lewis seems to be running at about two per season at present but there are a few more races these days so perhaps we can stretch a point in this case. And that brings me to his latest error - the first corner incident in Fuji. There is no arguing that it was a straightforward matter of missing his braking point; Lewis admitted so and it would be nice if Massa were to be as honest in his assessments of his own blunders. Ignoring the absurd penalty decreed by the stewards for the incident (since I have had my say on that in the previous post), what really annoys me is the storm of criticism that Hamilton has reaped for an error so common that we see it at nearly every GP. He is called "stupid" and "dumb", he is "cracking under the pressure", it was not world champion class driving, he should have been more careful (meaning that he should not take an overtaking opportunity when offered). Well, if he is stupid for attempting the pass, the whole field is as well, since they have all made the same mistake at times. But no, we expect Hamilton to somehow do the impossible by overtaking without outbraking, magicking a situation where no one is at risk and there is never any danger of a collision. Either that or he should have just sat behind Raikkonen and waited for Massa to catch up to them. As it happens, I think that was exactly Hamilton's strategy in the event of Raikkonen getting ahead at the start. His tucking in behind the Ferrari was a clear indication that he accepted the situation and was prepared to follow Kimi through the first corner. And I am pretty sure that Raikkonen triggered the automatic racer's response to take the door that Kimi suddenly opened. That may have been intentional or accidental on the Finn's part; but it is clear in the video that Raikkonen starts moving left, rather than keeping the inside line covered. Watch Raikkonen's battle to overtake Kubica later in the race - the Pole demonstrates how difficult it is to pass a man who keeps to the inside for a corner. If Raikkonen does not know this after all his racing experience, he is not half the driver we thought he was. And that is what inclines me to think it was a deliberate ploy, to tempt Hamilton into overcommitting himself. It worked, of course - Lewis is too much the racer to refuse an opportunity like that. Which brings me to the point I wish to make. Lewis is a racer and it does not matter how much common sense and strategy is poured into him, he will take a chance when it presents itself. You may call it a rush of blood to the head, not thinking in terms of the championship, whatever you like - but this is what the great racers are made of. It is a natural reaction for them to go for the gap and yes, Lewis went for it. That puts him in the same mold as Gilles Villeneuve, Ayrton Senna and Jean Alesi. Gilles never became champion, Ayrton threw away as many championships as he won and Jean managed one race win in his entire career; but they were masters of their craft in a way that the Prosts of this world will never understand. You may prefer the percentage driver who quietly accepts second place while totting up the points - me, I would rather see a driver who gives his all to each and every race, who races to win and never mind the championship. On the evidence so far, Lewis is a racer through and through. Cast your mind back to the early races of last year when he astounded us with overtaking moves that looked impossible. Each of them could have ended in disaster but his luck was in at the time and they worked - thus fueling the Hamilton mania that we grew so sick of. It is only to be expected that sometimes they don't work and we can sit in our armchairs, scoffing at such a "silly" move. If we look at the present drivers completely dispassionately, I think we have to admit that there are only two drivers who fit the racer type completely. One is Hamilton, as I have said, and the other is, ironically enough, Fernando Alonso. Both are there to race first and foremost, both make overtaking maneuvers that seem miraculous when they succeed but look a bit optimistic when they don't. The real tragedy is that Kimi Raikkonen used to be one of these all-or-nothing guys but Ferrari seem to have knocked it out of him. And F1 is the poorer place, thanks to that. But we have an adequate replacement in Hamilton, I think. He has been an F1 driver for less than two years but, in that time, he has given us more to marvel at, to chatter about, to stand in judgement on, than a host of other hopefuls. Don't despise his racing instincts - they are what make him what he is. I completely agree. I also called his move stupid although not for the fact that he took an obvious opportunity. I believe it was stupid for the simple fact that he only needed to keep Massa behind him and any opportunity for the stewards to punish him they will do. He could have followed kimi through the first corner and then took him during the lap (his tyres warming up quicker would give him the edge). However he made the decision and if it had come off we would have seen a great move under intense pressure. See? Now, this is why I read this blog - Sense! The spectacle of Hamilton racing is worth sitting down to watch even if the actual score is re-written after the race (I am pretty sick of seeing the word "provisional"). I'm also glad that Alonso can run at the front again, without having to get in a ferrari to do so. I hope it continues next year. Lee: You have said it perfectly - the move that works, we call brilliant; the one that doesn't, we call stupid. It makes me think of David Coulthard and all the failed overtaking attempts he has made over the last two seasons. Yet he was a gritty fighter in his day and passed some drivers that he wasn't supposed to be quicker than. It's a shame that his luck seems to have deserted him completely of late. Nick: Fernando seems a perfect fit with Renault, doesn't he? In terms of budget they are a small team but, add Alonso, and suddenly they achieve wonders. I think they need each other, just as Senna was always a McLaren man at heart. Lewis appears to be going through that Media phase of after they build you up, they knock you down. For people to say `should done this`, `should of done that` is just pointless, because we might play the games and think we know it all it doesn`t qualify us to say anything about those millisecond decision`s that go on in the car, thats why they are there, and we wish we were. To think Lewis is not a gifted racer is just lying to yourself, but how long would you last under all that pressure?, FIA bias ,the son of a wartime Nazi with what looks like to me to be a vendetta, the Racist chanting aimed at you and your family, even if Lewis never wins the WDC he will be remembered as an extraordinary talent and one with a backbone of steel. Well ive had my say, iam off to forget all about F1 till Sunday, I feel sick to the stomach of the whole sorry affair. I kind of like a driver who every once and awhile gets overcome with the red mist. That's what drivers are supposed to be all about...not some corporate speaking automatron. Hooray for Lewis and Fernando. They're the real deal. Gusto: Exactly. Easy enough for us to sit in our armchairs and to criticize everything we see. Not so easy for the guys actually in the cars. Don: Right on, those are the guys who attract new viewers to F1 - the ones who will take a risk and give it their all. And that is why Gilles was so loved worldwide; he crashed a lot but, dang, his will to win was ferocious. Who else from his era inspires such passionate support even now? Mr. Hamilton's very DELIBERATE actions at Japan. Un-sportsmanlike is the correct term and at the end of the day he got just what he deserved ......... NOTHING! Okay, Number 38, explain exactly how Lewis expected to benefit from his actions in Japan if they were deliberate. If losing several places at the first corner and then somehow persuading Massa to take him out on lap 2 was all in the plan, I can't wait to hear what his motives could possibly have been. I'm sorry but that is exactly the kind of illogical reaction to Hamilton that prevents any sensible assessment of him as a person and as a driver. There is nothing unsportsmanlike in attempting to overtake the driver in front of you and then misjudging your braking point - your own favorite, Massa, has done it many times. Number 38, Is bourdais also un-sportsmanlike too? After all he was also hit with a penalty for having the cheek to not pull over and put his car into park in order to let massa past. Gusto: If we can't make a judgment of those actions decided in miliseconds, it is a valid argument for every sport, every race, and every driver. That would make us monkeys, we wouldn't have any opinion, like wax statues. If you are here, having your say about what happened yesterday is because you HAVE an opinion indeed. Clive: I think you are right about most of what you said. But maybe you're missing some important points. Nobody with a working and sane brain can say Hamilton is not a top class racer. I'm with you when you make a balance and find that most he has done is awesome than awful. On the other side, what I think is happening here is that Newton rules are being demonstrated. You know, if you apply a force into an object it will react with another force equal in dimensions but on the opposite direction. Press has take the Hamiltonmania at assault, making judgements with few real arguments. And with collateral damages (just to name Alonso). The rest of the world has reacted with another force on the opposite direction. Hamy is crap, moron, medium class, etc. He has demonstrated he is a racer, of course, but let's be serious. He wasn't last year when Monaco, and some press was selling that he should be the next big thing with no discussion. Not being in a midfield team within a real competition with a real teammate hasn't helped him. We all know Alonso was able to put 3 seconds between him and Tarso Marques. But we can only find a comparison on the Hamilton-Alonso war, and you will agree that we DON'T KNOW anything of the inside of that story. Another point I disagree is when you say that his racer spirit is what it is and we should praise gods for it. I prefer him to be aggresive. In fact. I would preferr all drivers to be aggresive, although only two are real drivers at the moment. 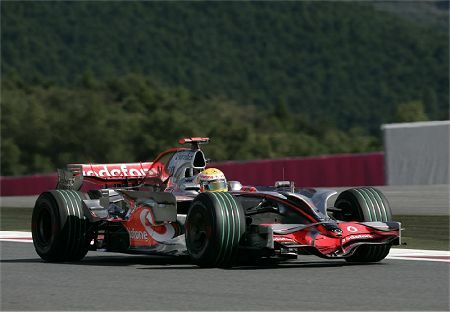 But Alonso choose not to race against Montoya in Brazil 05, because he was able to see the big picture. I'm not saying that Hamilton can't see it, but he hasn't demonstrated yet. And you will agree on this: He NEEDS to do that to become WDC. I agree with you Clive and whatever Architrion has mentioned above. While Hamilton is a great racer, at times I think what he does is avoidable. I cannot remember much but in this year his move on Glock in Monza and the first corner here in Fuji comes to my mind. While it is great to see a racer pounce on any given opportunity, I simply cannot accept such a deliberate move with utter disregard for others. You would probably boo me by saying racers are there to win, but I feel there is a thin line between aggressive and crashing other's party, let alone yours at times. He has a faster (at times the fastest) car, he can afford to take it a little easier at times. I just wish he does those marvelous overtakes without snubbing others to a great extent. I do not think when Kubica condemned Lewis for his move on Glock, he was jealous. If every racer had been this aggressive, all we would have left would be Fisi fighting with Barichello for P1. Ok I know I am exaggerating, but I hope you get my point. I somehow think comparing Hamilton to Ayrton Senna and Gilles Villeneuve is a bit silly. He is in his sophomore season and to compare him to legendary drivers does no one favours. In fact one of the most criticized things about Lewis Hamilton is his tendency to do just this. All the same, this is only his second season and he has a great deal to learn. Jacques Villeneuve won in his second season but it was very difficult for him considering the Williams he was driving was a fair margin better than anything else on the track. He wasted many points through lack of experience. Lewis Hamilton should be compared to Lewis Hamilton. If the critics want to compare fairly, (yes, you too Clive) compare his first two years to other's first two years. Lewis is doing just fine and it's fairly certain he will do better still in the future provided he doesn't believe all the publicity or his own braggadocio . If he believes he is already as good as the best, does he believe he has nothing more to learn? Let's hope not. Despite the ignorance of those in charge, at the present Lewis is THE drawing card. AS far as being equal to the past greats, we will have to wait until his career is done to fantasize the Great Race! Couldn`t stay away, must be in me blood. Now that the steam coming out of my ears is down to a gentle roar and have had time to think about it, I am even more certain he was a inches away from pulling off a start that would go down in racing history, I thought after seeing the lockup and keeping kimi on the outside were he`s rear gunner completed the move was not bad damage limitation, it was only after I realised he had dropped places and he`s tryes were shot (didn`t stop him overtaking Massa) that the move was a little to ambitious. I am not saying we cant make judgements on he`s driving, its the way we say `what he should of done` or the one that makes me laugh is the `on my PS3 I do.......` to compare a PS3 game to the real thing is well.....if you were really there you wouldn`t do anything apart from crap your pants and cry for your mummy,and after 10 minutes the G-forces would render you unconscious. Gusto: Nope.... Ron Dennis said that they've talked about the correct strategy before race, and it was clear that he must hold position if Kimi was ahead. They tried to make him clear that he is racing Felipe. Kimi is out of the game, and he knew it. To lock up your brakes in the fashion Hamilton did is an act of instinctive desperation. Coming from a place where traction is limited 5 months of the year, you learn that when your wheels are sliding you are not slowing down as quickly as when they are not. When you are young you invariably learn this the hard way if you push the limits. If you are still thinking properly and haven't said, "Well, I guess I'm along for the ride now," you don't just keep your foot buried in the brakes. Hamilton had a momentary mental lapse, as is human nature. I doubt very much he will make a habit of it. To be where he is today is partly because he learns quickly. Aw .... lighten up Clive, Hammy is his own worst enemy. After a few podiums last year he started thumbing is nose at Alonso and the DECAY had begun. He's got what many would consider the best car in the field, he is a half decient driver, with all of Ferrari's misfortunes this years why is he only 5 points up on Massa? MASSA, the driver with a one man fan club !!!!!! But it isn't me, I'm still trying to find a seat for Anthony Davidson. I meant to buy you a pint at Sylvan St. last month but my Mom died and plans change. Next time. I`ll have to disagree with you there Nick, I imagine the only thing going through every drivers mind into turn 1 is will I be alive for turn 2, and have you tried `feathering` 75kg of pressure with the tip of your foot. A truly great driver is the Man who pushes the car past its limit and lives to tell the tale, Fangio at the German GP in 57 springs to mind . I think Lewis will be more disappointed with the car more than with himself. Completely agree, everyone makes mistakes and it just seems like pro-ferrari fans like to see him make them but that's the way it goes I guess. You simply can't deny how good Lewis is. I agree too that Raikkonen was always the biggest do or die driver in the championship, that was comepletely summed up in the Nurburgring race where he tried to finish on shot tyres to keep 1st instead of pitting, that time it didn't work out and he didn't finish at all, another time he might of taken the victory heroically. Unfortunately he has changed somewhat since he moved to Ferrari. Great piece of reasonable and logical prose. Thanks! Only you could go into the real point and see the whole picture. About Lewis, I think he is the best thing that happened to Formula 1 since Senna. I´m not saying he is the next Senna, but that he brings the sense of entertainment we lack on the days of Schumacher. None after Senna could deliver this sort of things we´ve seen Lewis doing race after race and as we will see season after season. Roger (Architrion): You guys have been busy while I was catching up on the lost sleep of the last few days! I'll try to catch up. I hear what you're saying, Roger, and I think I did mention the effect of Hamilton mania in my post. Of course the bashing is a backlash against that and it is just as unreasonable as the hero worship that brought it on. But I think you make the mistake of blaming Hamilton for it - he is hardly responsible for the silly hype the media puts out. Agreed that Hamilton would have done better to have stayed tucked in behind Kimi for that first corner - that's pretty obvious with hindsight. Lewis knew the score and Ron Dennis has said that they went over the strategy for Raikkonen grabbing the lead again and again. But that's my point - Hamilton is a racer and it really doesn't matter how many times you agree on a sensible strategy for the race; if he sees an opportunity to move up a place, he'll take it. It's why I'm warming to him as a driver and have given up on Kimi. No, Clive. I didn't blame Lewis at all (maybe my poor english is playing against me). I can only find guilty brit press. And the only time Lewis should keep his mouth pretty closed was when he called backmarked drivers ¿rats?.... can't remember the word. I won't be the one who defines a driver for what he says instead of what he drives. It will be great to discover that Lewis does what he has to do when he has to do it. Maybe you feel sorry, but I will like it very much. Bluray: I have avoided writing anything about the Monza Hamilton/Glock incident (and Hamilton/Webber) so far because I think it was adequately dealt with by Keith Collantine at F1 Fanatic. But, to summarize, I will point out that, when other racers do it, it's classified as hard but fair. Raikkonen did it to Massa on the first lap at Monza and it received little more than a mention. Let Hamilton do it and everyone yells foul. Personally, I think things should be as they were in the old days - the driver in front has a duty to give a competing driver enough room to stay on the track. That went out the window as far back as Dijon 1982, when Villeneuve and Alonso had their incredible dice over the last couple of laps (incidentally, I was one of the few to point out at the time that both should have been penalized for dangerous driving - I have since decided that what the heck, it was great racing!) and now it seems that it's quite permissible to move over on a driver until he has only the option of easing off or going off the track. Sauce for the goose and sauce for the gander - if others are allowed it, then so is Hamilton. Also incidentally, the stewards penalty for Hamilton at Fuji will affect this matter of forcing another driver off the track. The penalty was given for exactly that and, just as the Spa ruling has affected subsequent decisions, so will this one. If they wish to seem fair, the stewards will have to punish all such instances in the future. Result? Even more penalties and stewards inquiries. This is what happens when the officials start trying to manipulate the championship. I do see the Hamilton media hype as just that.....media hype. Can anyone really rank him higher then Kubica or Vettel? He is on a better team and seems a bit more mistake prone then the other two drivers. If Hamilton were to drive for either BMW or TR, he would be getting the same results as Kubica or Vettel. Probably worse, since Hamilton has a tendency to push too hard at the wrong times. Nick: No arguments there, buddy, I agree completely (I said in my post that I won't call him the new Senna yet). Quite right on the dangers, too; if Lewis lets it all go to his head, he could self-destruct quite badly. But I think he's managing it adequately so far - not perfectly, just adequately. Gusto: Good point - easy for us to sit at home in judgement, not so easy to actually drive one of those cars. Number 38: Sorry to hear about your mom, Roy. I hope everything goes well otherwise. And yes, we must have a pint together again when the opportunity arises. You asked me the wrong question this time, too. Why is Hamilton only 5 points ahead of Massa? Because the FIA keep taking points off him and giving them to Massa, that's why! Pootle: Spot on, in my view - Ferrari seems to have taken the spirit out of Kimi's driving over the last few years. Either that, or something's going on that none of us know anything about. Becken: Thank you. And I love the Senna quote - so typical of the man to tell it like it is! Maybe one day we will be able to sit back and say that Hamilton is as good as Ayrton was but that day is a long way away as yet. Until then, it's great to watch Lewis messing with the big reputations and causing so much debate. Roger: I do think we have one yardstick to measure Hamilton against - Alonso. There was very little to choose between them when they were team mates and that has to say something about Hamilton's talent. As to whether Lewis would be as outstanding in a lesser car, we all wonder about that. Usually a driver of such obvious talent manages to get the best out of whatever equipment you give him, however, and I'd expect Hamilton to do the same. Aracer: A debatable point, indeed. Kubica and Vettel are very hard to assess at this stage since we cannot be too sure about the quality of their team mates. And that makes it much harder to guess whether they would be as quick as or quicker than Hamilton in a McLaren. But that is always true in F1 and sometimes we never learn the answer. Take Frentzen, for instance - quicker than the Shoe in sports cars, never really delivered on the promise in F1, mainly because he never had equipment as good as Michael's. Or was it "nice guy syndrome"? We'll never know. I miss the really old days, there was at least a little courtesy in racing. I blame motorhomes. In the 60s the drivers stayed at the same hotels, ate at the same restaurants and went to the same post race parties. they gained a sense of respect and comaraderie today's guye don't have. Hamilton just displayed his immaturity, nothing more. After last year he should have learned to focus on the championship a bit more. He hasn't, maybe he never will. If he doesn't, he won't win many championships. As for Kimi, I wonder if the cars development has gone a bit more Massa's way than Kimi's. I think Massa needs a bit more forgiveness in the set-up and that doesn't suiit Kimi. If you remember. JPM said the same thing about himself and Kimi, that at one point the decision was made to develop the car to Kimi's preference aand that hurt Montoya. What do you Think? Nick: Ooops, that one got by me. I meant Arnoux, of course. Money changes everything. Today, a driver knows they can bank $25-35 million per year if they land on one of the 2-3 top teams. This has spelled the end of courteous drivers. Now, drivers are as much celebrities as they are athletes and they no longer live life like regular folks. Lewis deserves every bit of the criticism he's getting. Not because of his arrogant persona (who cares), but because of his driving. When you say he's made ONLY 2 MISTAKES, it gives me the clear impression you haven't followed the season. Did you forget Canada, the most pathetic piece of pitlane driving in history (even better than Lewis' own Shanghai disaster the previous year)? Did you forget Bahrein where he lost his front wing crashing onto Alonso's back and destroying his race? Did you forget Magny-Cours and Spa, where he cut chicanes while retaining illegal racing advantages? Did you forget Monaco, where early in the race Lewis smashed his rear tyre on the wall (he was lucky enough to make it all the way to the pits, fill up the tank, get helped by a safety car incident immediately afterwords and have his prayers for the rain to stop answered)? Now, all of this is fine when you're an inexperienced young driver. This is what Lewis is, despite his brilliant talent. Nobody is saying he's terrible; people just expect way too much of him, and the comparisons with the great Senna won't help. Pitlane driving- gotta be DC when he entered the pits in the Williams to fast, spain? I don't regard it as ranting, Paz - in fact, I am just calling for a little more realism when we assess Hamilton. The mistakes I included were the big ones, Canada and Fuji. I admit to having forgotten his slight cutting of the chicane in Magny-Course (and I disagree that he gained an advantage from it), although plenty of drivers have done the same this season and got away with it. Bahrain was caused by a disintegrating front wing that caused sudden understeer, Monaco was lucky, yes, but drivers need luck too and in Spa he was forced off the track by Kimi (I have argued that one out before - you may not agree but it's the way I see it). So I may have exaggerated a little but it does not detract from my main point - which is that we need to be much more realistic when assessing Hamilton. It seems there are two camps - people either hate him or can see no wrong in him, and I'm just saying that the truth lies somewhere in between. Which is, more or less, what you are saying too. Gusto: Give Paz his due, he has raised a serious point, perhaps more than he intended. At a glance, it does appear that Hamilton has made a lot of errors this season. But investigate them a bit more closely and we find that many of them are matters of opinion. I referred in the post to the two major errors that are beyond argument; the others are so minor that they would hardly have attracted comment if it had not been Hamilton who committed them. As regards Monaco, Hamilton was incredible to watch there last year - he was letting the tyres brush the armco lap after lap. Such precision was what first impressed me about the guy. But he may have paid for it this year in that it was probably overconfidence that caused his rather more serious brush with the barriers. You were almost correct by predicting Heidfeld as champion, because right now the obvious pick is Kubica. Number 31 is correct in saying Hamilton is his own worst enemy, in fact the entire teams of McLaren and Ferrari are their own worst enemies; if Kubica keeps composure he will become champion as mechanical failure, pitlane mistakes, and a trip to the gravel next to the pit entrance do in the other contenders. I agree with the commenter that say a successful move is "brilliant" and a failed move "stupid". Most drivers in GP2 and quite a few in A1GP are dismissed as "stupid" for just that sort of reason. Lewis Hamilton is showing F1 that he is a second year driver, and since the field now are extremely familiar with his style, they can defend against it much better. He is starting to remind me of Marco Andretti in the way he has fits and loses his mental composure, the difference being that Hamilton displays talent in adverse conditions and will probably enjoy a long and storied career. The most fair assessment of Hamilton to date. Great article Clive. Chunter: I would be quite happy to see Kubica grab the title at the last - he has driven well this year and learned a few things from Heidfeld about staying out of trouble. But I think those who are now saying he will come through because of the mistakes of the two main contenders are too easily swayed by one race. With the scoring system as it is, quite a small buffer can take several races to overcome and Robert is out of it if either Massa or Hamilton score heavily in either of the forthcoming races. It is a bit too much to hope for that they will both continue to shoot themselves in the foot. I just posted a very long comment and it has disappeared. Please tell me it is in the spam filter or something because I don't have a copy. Assuming my comment has gone south the summary was. There is no difficulty in assessing Lewis because he blew Alonso out of McLaren last season. Lewis is the closest thing to Gilles we have ever seen and Gilles was better than Senna. He may only have done two seasons but Gilles only did 4. Kimi is only struggling this year because of the car and there is every possibility he will blow Massa away next season. The team are unable to dial out the understeer as they did because this year's car for whatever reason has way too much for him and secondly there is something about all the cars at the front of the grid this year that favours an aggressive driving style over the smoother driver in each team although that effect was to some degree reversed at Fuji because of all the late apex corners. A full explanation of this theory can be found on the last sidepodcast show. Should my original post turn up Clive would you please delete this one? I'm afraid your comment has gone, Steven - if a comment doesn't get through, it isn't saved. Sorry about that. When the system does reject a comment, the thing to do is to hit the back button on the browser and that will take you back to your comment. It can then be copied and saved before trying again. If the system gets really awkward and keeps rejecting a comment, even though you know your CAPTCHA was correct, the best thing to do is to leave the comments system and then start again from scratch. If you save a copy of your comment, it can then be pasted back in and just the details filled in. I always check the captcha has worked and on this occasion the first thing I did was backspace to the page I had been typing in but the comment was gone. Normally if I leave a long comment anywhere I copy it just in case. I guess I need an automatic copy comment reminder. I must admit that I've never had that happen to me, Steven - and I have no idea what would have caused it. It's perhaps possible that the spam filter caught it (which would mean that it has definitely disappeared into the ether) although, if I remember correctly, Mad's filter works through recognising certain word combinations which are unlikely to have occurred in your comment. I know he'll see this (he gets a copy of the email notification) so he should have a look and see if he can find out what happened.